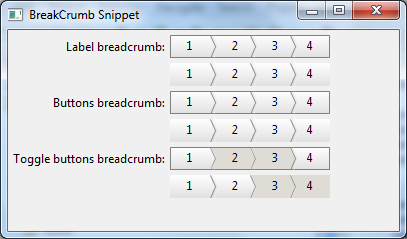 The BreadcrumbItem can be labels (style SWT.NONE), buttons (style SWT.PUSH) or toggle buttons (style SWT.TOGGLE). An example called BreadcrumbSnippet.java is located in the plugin org.eclipse.nebula.widgets.opal.breadcrumb.snippets. This page was last modified 09:55, 21 February 2018 by Laurent CARON.